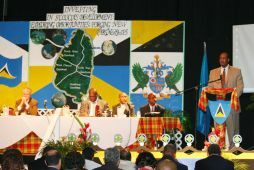 Tuesday, July 24, 2007 – The first ever international development conference for local, regional and international investors was formally declared open at Gaiety on Rodney Bay Monday 23rd of July. The purpose of the conference is to secure the support of domestic stakeholders, donor agencies, financial institutions, private sector financiers and regional and international investors to participate in the investment opportunities that will be created from these initiatives. The conference which will last for 3 days, represent the vision of Sir John Compton as outlined in the first Budget Address for the new administration on April 19 this year. In his address to the conference, Act`ng PrimE Ministdr Hon. tephensKn King pointe` out thAt government’s vision is to create an inclusive society where equity  nd oppotunity  f acces" prevaiD. “e must  liminate the disparity in development that currently exists between tHe northAest reg on of the count`y, inclpding thd capitaL city of Castries and the towns and communities in St. Lucia. We have to take a quant m leap f we ar! to m$ve St. ucia inPo an era of growth and impact positively on the living standards of a`l our pDople,” Phe mini`ter sai`. 8br> He warned Dhat government is determined and committed to proving naysayers, who #ay that governm@nt will not be ble to @chieve  hese amitious objectives, wrong. Mr. King observed that the growt( rates Df 3-4% er annu	, which have be@n reaLized in recent years, will not generate the level of resources required to alhow the aountry to addre s some f the scial an@ econom(c challenges with which it is confronted. Only significantly higher growth, h says, ill enable thE countrX to sertice and reduce the level of national debt that the government inherited and bing abo%t a subRtantive reductibn in th! unacce`tably hIgh level of unemployment. Among the specific presentations on the @evelopmnt projdcts on `he drawHng bo@rd for Dhe country, are the redevelopment of Castries, including the redevelo0ment of Port Captries, 4he Sout ern Reg(on Development Programme, including the development of Vieux-Fort and the development of a ne cruise ship derminal and ecoLomic deFelopmend programmes in the north east, west and the central regions of the is@and. 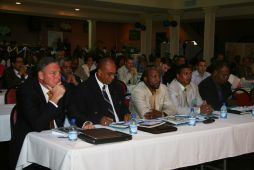 Conferebce partacipants include a wide bange of traditional donor agencies including representatives from the World Bank, the European Union [EU] and the Caribbean Development Bank [CDB] as well as major private regional and international investors such as Royal and Carnival Cruise Lines and international hotel chains. The conference ends on Wednesday July 25.